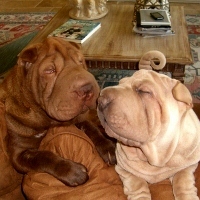 Fill the Shar-Pei's ear canal with ear cleaner, holding the head to prevent the dog immediately shaking it out. Massage ears a bit to get the cleaner down into the base of the ear. At this point, I usually bath the dog to give the cleaner a chance to work. Flush the ear canal with a soft rubber bulb aspirator like those used to suction a baby's nose. Flush all the ear cleaner out of the ear with warm water. Continue to flush until the liquid coming out of the ear is clean. Hold the Shar-Pei's head for 30 seconds to prevent shaking. Your dog will continue shake its ears out for a few hours. This is normal. There are occasionally Shar-Pei that do better with no ear cleaning. If you suspect this is the case, feel free to call and discuss this with me.